The silly season is well underway, and daft stories about Christian origins being really pagan — all told with glee — are circulated uncritically and believed unquestioningly by those so inclined. We might reasonably wonder, however, just why every major Christian holiday is subjected to this ritual of debunking, with the evident approval of those in power. Today’s fairy-story is that in 307 AD the emperor Diocletian proclaimed Mithras as the official protector of the empire. Those of us who know that Mithras was a mystery cult will rub their eyes at this a bit; was Diocletian really adding Mithras to the state cults? A general google search reveals much hearsay, and suggests that the source of all this is an inscription at Carnutum on the Danube, where Mithras is apparently described as fautor imperii sui. I find a reference to this as C.I.L. III, nr. 4413. Off to Google books, where some scholarly books might be found. And the magic name “Cumont” starts to appear. Oh blast! Off to Textes et monumentes, and there it is, in vol. 2, page 146, item 367, with a link to 227. Curiously Cumont lists the monument and its inscription separately. Here’s the details. 367. Carnuntum, CIL, III, 4413. Voyez le monument n° 227. | Augusti et Caesares | sacrarium | restituerunt. Always nice to get a chunk of Latin as explanation. Monument 227 is on p. 331-2, where there is a picture of the monument (fig. 205). It’s an altar, with a picture of Cautes on one side. 227. — Grand autel [H. 1.45m, L. 0.92 m] au xviii” siècle à Petronell dans la cour du château du comte Traun. Aujourd’hui au musée des antiques de Vienne. Décrit : Hormayr, l. c, n° 229 ; Labus, Ara Antica di Hainburgo, 1830, p. 9; Arneth, Beschreibung der zum K. K. Miïnz- und Antikencabinet gehorigen Meilensteine, etc., n” 15; cf. CIL, III, 4413. — Reproduit : fig. 205, d’après un croquis. Sur la face antérieure on lit l’inscription n° 367. 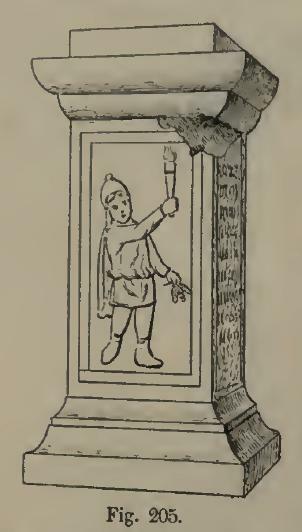 Sur le côté gauche, un dadophore dans le costume oriental ordinaire tient de la main droite une torche élevée et de la gauche trois épis. Sur le côté droit, un porte-flambeau semblable abaisse seulement sa torche. We may mention first of all the dedication by the Tetrarchs dating to the year AD 308 (V 1698). 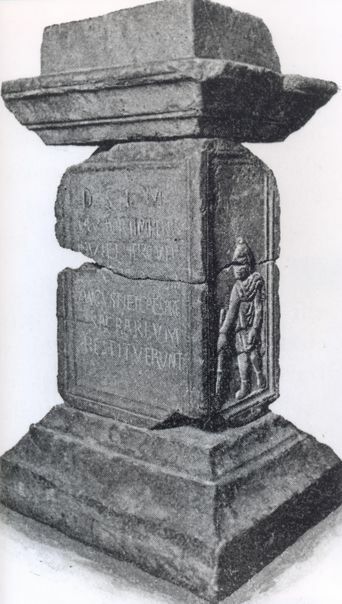 On the occasion of their meeting at Carnuntum in Pannonia Superior, Diocletian, now in retirement, together with the ruling emperors, the Iovii et Herculii religiosissimi Augusti et Caesares, dedicated an altar to Mithras as fautor imperii sui, as protector of their empire, and thereby gave expression to an understanding of the god already shared by Mithraists for centuries. Concomitantly, the Tetrarchs had part of Mithraeum III at Carnuntum repaired. The reference to ‘V 1698’ is to the collection of monuments by Vermaseren, making this CIMRM 1698. Deo Soli invicto Mithrae, fautori imperii sui; Iovii et Herculii religiosissimi Augusti et Caesares, sacrarium restituerunt. To the unconquered sun-god Mithras, patron/protector/supporter of their imperium; the Joves and Hercules’s, the most religious Augustuses and Caesars, have restored the shrine. Not quite the same as an official edict creating Mithras the protector of the empire, is it? As an afterthought, I look in the Clauss-Slaby database. This reveals only 6 inscriptions which use the term fautori, always as “protector”. But… great news, the database people have included a photograph! The link won’t embed in the blog software, so I’ve had to copy the image. The original is here, although that link doesn’t look very permanent. Enjoy it, and think kindly of those chaps in Eichstatt who put it online.